To make the marinade, in a blender or food processor, working in 2 batches, add the achiote paste, bitter orange juice or its substitute, chicken broth, garlic, oregano, cumin, allspice, salt, and pepper and puree until smooth. Slide the turkey, with the breast side down, into the brining bag. Pour the marinade into the bag and massage it into the bird, working it into the cavity and all the crevasses. Place the bag in a mixing bowl or roasting pan and refrigerate for 12 to 48 hours, turning the turkey a couple of times to redistribute the marinade. Set the oven rack at the lowest position and preheat the oven to 450 degrees Fahrenheit. Spread the onions and tomatoes in a large roasting pan. Sit the turkey on the vegetables breast side up. Stuff the main cavity with as much stuffing as it can hold and place the rest in a buttered baking dish. Close the cavity by crossing and tying the legs with butcher’s twine. Tuck the wing tips under the turkey. Pour as much of the remaining marinade over the turkey as will fit halfway up the pan. Roast the turkey for 30 minutes. Cover the turkey with layers of banana leaves, if you are using them, and then cover the entire pan with aluminum foil, sealing it as best as you can. The less steam that is able to escape the better. Reduce the oven to 350 degrees Fahrenheit. Place turkey back in the oven and roast for 3 1/2 hours, or for at least 12 minutes per pound. Remove from the oven and carefully remove the leaves and/or the foil, being careful as the steam is hot. Return to the oven and roast for 20 more minutes. The turkey should be completely cooked through and nearly falling off the bone. Remove turkey from the oven and let it rest for at least 15 to 20 minutes, loosely covered with the aluminum foil. Strain all the cooked vegetables and juice into a medium 3-quart saucepan, pressing with the back of the spoon to get as much liquid as possible. Set aside 1 cup for the stuffing. Simmer the remaining sauce for 15 to 20 minutes, until it has reduced by half. While the turkey rests, pour the reserved marinade over the stuffing in the baking dish and place it in the oven for 20 minutes, or until it is hot and the top is crisped. 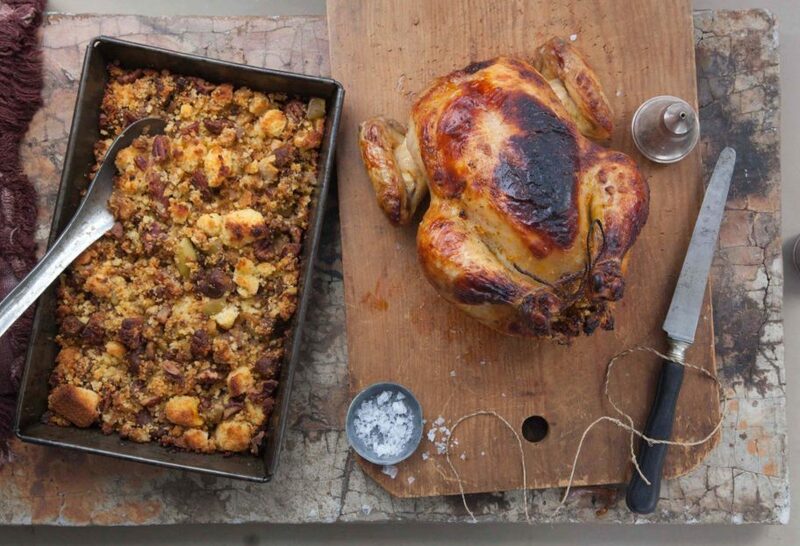 Carve the turkey and serve with the stufﬁng. I assume that the skins are on the garlic because it is toasted before blending. The recipe implies the papery skins go in the blender. That doesn’t seem a good idea. You peel the skin off the garlic after you char it. Enjoy the turkey Antonio! I love the bitter orange and achiote blend. use it on lamb chops (with a bit of rum). I’d like to try your turkey recipe. I wonder whether it might cook well spatchcocked. Any thoughts? Give it a go, Antonio! Thank you for tuning in every Saturday, Carlos! Hope you had a great Thanksgiving. If my turkey is smaller like 14 lbs, should I reduce the amount of marinade? You can by a bit, but I used a 16-18lb turkey, so you don’t need to reduce too much, Claudia. Feliz día de acción de gracias, Pilar! Have a wonderful Thanksgiving Pati, thank you so much for sharing your culture and being such a great ambassador for Hispanic culture. As well as showing how much more the food of Mexico really is! Muchas gracias Señora. Thank you for the kind words, Margi! Have a Happy Thanksgiving! Last year I had everything ready and the element in my oven burned out while it was pre heating! We ended up smoking it which all the flavors away! So this year, with a NEW oven Im so excited to make it!!! Wish me luck!!! Oh no I’m sorry you had oven troubles…but good luck this year! Hola Pati hermosa, me inspiras mucho, eres una mujer linda, gracias por ser como eres, el ano pasado hice esta receta, pero ya no hayo el video, Pati me puede ayudar porfavor, quiero ver el video.. Se ve super bueno…!!! Lo acabo de ver por tv….y wow…!!! THIS TURKEY RECIPE WAS A WINNER AT OUR HOME THIS YEAR!!! Hi Pati, What do you recommend we do with the grease that comes off the turkey? Do you separate it off before you push the solids through the sieve? Thanks for your help! ​Yes! That is a good idea. Hi Pati do I use the same marinade that I used for the Turkey, back over the Turkey when I roast it? No…when you roast the turkey the juices from the bird and veggies is what you use to make the sauce. Super!!! Feliz Día de dar Gracias a ti! We just put the bird in to marinate last night at 1:30 AM. Ivan has posted the photo on FB. Can’t wait to see how it turns out at tomorrow’s dinner here in DC! Yay! I hope you all enjoy it and have a Happy Thanksgiving! Hey Pati! Happy Thanksgiving to you and your family. I’m proud to say I’m doing your Thanksgiving this year. The turkey, the stuffing, the sweet potatoes. But I chose a dessert out of all your desserts, and I’m doing Oreo Conchas. Thank you. Have a great holiday. That’s awesome! Have a very Happy Thanksgiving too! Wow.gracias por compartir. Y la receta del relleno donde lo puedo encontrar. Hola paty. Gracias por la receta, es facil y el turkey se mira delicioso. Donde puedo ver el video del relleno. Bye. Tnks. If I am cooking the turkey in a bag instead of banana leaves (I could not find any) would I add the onion and tomatoes in the bag or sauté separately??? Im Truly one of your biggest fans!!! Wow, thanks for sharing with so much love, caring effort and dedication. Love your recipes Patty. On my way to get the ingredients 🦃! I hope you love this recipe too, Bernice! Pati – I fell in love with your show while I was on maternity leave last year. I’m trying your recipe for Thanksgiving this year. I am so excited to try it! Wish this 1st time Thanksgiving cook good luck! Pati it’s just my husband and I can I do the same thing with little game hen ? Absolutely! You can also do it with a chicken if you like. I recommend you cut down the ingredients and the time on each step by a third if you use a 3 pound game hen or chicken. Wonderful!!! Can’t wait to try it. Thank you. Just saw this episode in Australia. Mexican food ingredients are not widely available here. So what can I use to substitute achiote paste? Also, would regular orange juice instead of bitter orange work? Thanks! You can make a bitter orange substitute and here is the recipe: https://patijinich.com/recipe/bitter-orange-juice-substitute/ There isn’t a substitute for achiote paste…but you can maybe find it online. Thank you Susan. I’m so happy you really enjoyed the episode! If I didn’t want to put stuffing inside the turkey, what would you recommend to put inside in order to infuse flavor and maintain moisture in the turkey? You can put onion and/or celery and/or carrots…or you can quarter and stuff the turkey with oranges. I’m watching now and can’t wait to make this — also, thanks to the other viewer that mentioned trying this with chicken — what a great idea! Pati, thank you for entertaining us with your stories and delicious recipes. You’re a wonderful teacher! Just saw this on TV. I tell you I was drooling the whole time and I’m not waiting for Thanksgiving to do this. Thanks. I tried this recipe on a chicken. The aroma was amazing & the chicken so moist. My husband enjoyed it too. Can’t wait to do the turkey now. Thank you! Isn’t the aroma to die for…I’m hungry just thinking about it. Hope you like the turkey! I am so flattered. Thank you so much for watching & for taking a minute to write to me!